Eugene  (pop. ~140,000) is a city in Oregon at the southern end of the Willamette Valley that is best known for being the home of the University of Oregon. Citizens of Eugene are environmentally aware people who love their coffee as well as their microbrew. Residents range from arch-conservative republicans to militant anarchists of the kind who were responsible for the WTO riots in Seattle. However, overall the population is typical Pacific Northwest, i.e., leaning toward a greater degree of social responsibility, respect for nature, and diminished consumerism. 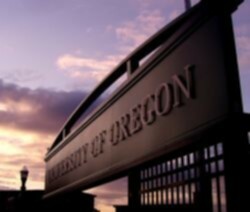 Eugene is home to the University of Oregon, aka "The Fighting Ducks." Eugene was the second home to the rock band The Grateful Dead, thus the reason some people see this city as a "Hippie Mecca." Saturday Market  has been continuously in operation since 1970, rain or shine and claims to be the oldest open-air market of its type in the United States. Portland International Airport (IATA: PDX) is the next nearest airport for additional flights with additional airlines from other U.S. and international cities at more competitive fares. From there one can rent a car or catch a ride with Hut Airport Shuttle to get into Eugene. From Interstate 5 (I-5) Eugene is accessed from exits #189 ("E 30th Ave South Eugene") through #195A ("Gateway Mall & Springfield")/#195B ("Florence & Oregon Coast") along I-5. To get to downtown, exit off at the Interstate 105 (I-105)/OR-Hwy 126 off ramp at Exit 194B (Exit 194A to go east on OR-126 to Springfield), just beyond Gateway Mall if going southbound. I-105 goes 4mi/6.4km west and ends at W 7th & Jefferson, west of downtown. Follow the signs towards downtown. Likewise you can exit from I-105 at Coburg Rd at Exit #2 and go south into Mill St & E Broadway in downtown. To get to the University of Oregon from the northbound lanes you can also exit off at "Franklin Blvd (OR-126)" at Exit #192. This exit is not accessible from the southbound lanes. From Bend go north on US Hwy 20 to Sisters and west on OR-Hwy 242 (left on McKenzie Hwy during summers when the road is open). Go across the Sisters Mountains to the OR-Hwy 126 junction and go west on Hwy 126 to Springfield. The road enters into Springfield from the east as Main St. If Hwy 242 is closed due to snow accumulation in the mountains (from Sisters) continue northwards on US Hwy 20 to the junction with Hwy 126 or continue further to Sweet Home. From Sweet Home go west on OR-Hwy 228 to get Interstate 5 (I-5) (17mi south of Albany at Exit #216). Go south on I-5 to Eugene. There's no central bus station or intermodal station. Each bus company has its own designated stops at different parts of downtown Eugene. Bike - Eugene has an excellent system of bike routes , and has bike friendly streets, and its bike paths allow you to ride along rivers, mountain trails and through covered bridges. Bicycle rentals are available from RENT A BIKE  (541) 579-5552. They drop off and pick up their bicycles, and charge only $30 for 3 days, or $45 for 1 week. Bus Lane Transit District (LTD)  3500 East 17th Avenue (800) 735-2900. $1.75 one-way or $3.50 for an all-day pass. Buses tend to run every half-hour. Extended LTD bus routes run east and west into more rural sections of Lane County. Oregon Ducks  — The teams representing the University of Oregon, competing in the Pacific-12 Conference, are Eugene's most famous contribution to the sports world. Ducks sports have benefited enormously from the financial support of Phil Knight, UO alum and head of Oregon-based sports equipment giant Nike. Currently, the highest-profile Oregon team is the football team, which rose to become a perennial national contender in the early 2000s and also (in)famous for its highly colorful and variable uniforms. Oregon also has am extremely rich tradition in track and field, with Hayward Field known for its enthusiastic fans; the city has become known as "Track Town USA" because of this. The main sporting venues (including Hayward Field) are all on campus. The football stadium, Autzen Stadium, is famous as one of the loudest and most intimidating venues in American sports. In 2011, the basketball teams moved to the new Matthew Knight Arena (nicknamed "Matt Arena"; named for Phil's son, who died in a scuba diving accident). Ducks baseball, revived in 2009 after nearly 30 years, plays at PK Park (not named for Knight), which is shared with the minor-league professional Eugene Emeralds. WOW Hall  Small concert hall featuring alternative performances. 291 W 8th Ave (541) 687-2746.‎ Ask about work trade opportunities between 3:00 and 6:00PM Monday through Friday--maybe you'll get to see the show for free! Jordan Schnitzer Museum of Art  at the University of Oregon. Local tour operator, specializing in Willamette Valley wine tours. A safe way to enjoy wine tasting in comfort and style. Eugene is a friendly city for cyclists and all outdoors enthusiasts. There are many well-maintained hiking trails, and bike lanes are designated on most major roads. A large butte just south of downtown. Head south on Willamette Street; the trailhead is easy to miss, but it's on the top of a crest in the road on the left-hand side. There is a large parking lot with signs and restrooms. Trail to the summit is close to 2 miles up, with about a 700-foot elevation gain. Trail is well-marked until about ¼ mile below the summit -- which then requires a bit of rock scrambling. A small butte just north of downtown. Original site of Eugene Skinner's cabin after which the town is named. This butte offers an excellent view of Eugene, and the Cascade mountains to the east. This butte was also the site of a scene from the movie Animal House. To reach the butte, head north on Pearl St. until you pass the large retirement home on your left, turn left at the next street (in between 3rd St. and 2nd St., unmarked) and after 1/4 of a mile make a right (unmarked). To get there by foot, you can hike up a trail opposite the train station and next to a Victorian styled house. If the weather is nice, you can go rock climbing at the natural basalt columns on the butte, or hike on some trails near the peak. Extensive set of hiking trails south of town. To find them, head south on Willamette St., one mile south of the post office, and shortly after 52nd street make a left at the trailhead parking lot. Eugene has several bark trails specifically for running. Amazon Trail is 1 mile long, and is located near South Eugene High School. Rexius Trail is 3.5 miles long and is on Amazon Parkway, just south of Amazon Trail. Pre's Trail is ~4 miles long and is in Alton Baker Park, just north of downtown off Coburg Rd. Paved bike path along the north and south banks of the Willamette River. There are more pedestrian bridges in Eugene than there are vehicular bridges, and you can see many of them from this trail. A good place to start is Alton Baker Park at 1820 Roosevelt Boulevard. You can sometimes rent bikes in the summer near the park's duck pond. This site features a guide to Eugene and Springfield area parks, displaying parks in the area with descriptions, interactive maps, images and 360˚ panoramas. One of the biggest "hippie" gatherings. Tons of great food, great hand made products sold by local vendors, and live music to be had. A multi-day community gathering, covering a city block of downtown. Features live music, street performers, vendors and a parade on the Sunday morning of the Celebration. Parade entrants represent the entire diverse Eugene community. A three-day ceramics only show and sale featuring over 60 local artists. Clay Fest draws artists from all over Oregon. This is a great opportunity buy unique handmade pieces directly from the artists who make the work. East 13th Street College and artistic oriented shops lined up along E 13th between Pearl and Kincaid (west of the UO campus). Highlights include the Bijou Arts Cinema (E 13th & Ferry) and La Perla pizzeria (E 13th & Pearl) (Bus #28,76,92,98). Cafe Morocco 30 East Broadway (541-344-6948) a North African restaurant next door to the Sustainable Table and sharing the same management. Cornucopia 295 W 17th Ave (541 485-2300) Fresh and local breakfast, lunch and dinner. Papa's Soul Food Kitchen BBQ Blair Blvd, 541-342-7500  Eugene's soul food restaurant, sometimes offering live music. The Sustainable Table, Inc 30 East Broadway (541) 344-6948 Offers a tasty menu with a strong emphasis on sustainable and organic ingredients and procedures, in an attractive downtown location. Sweet Life Patisserie 755 Monroe St (541-683-5696) World-class desserts, including vegan options. The 'Wich House (840 Willamette St.) Fresh ingredients, soup, salad, and 'wiches. Bruno's Chef's Kitchen 3443 Hilyard St. Hidden behind the Dairy Mart 541-687-2433  Price $25-$30 for a main course. A small, personal restaurant; Bruno changes the menu weekly, featuring local & seasonal ingredients. Mazzi's, located in South Eugene off of East Amazon Rd, has the best Italian food in town. Prices are reasonable, considering the quality of the food; a typical dish is $12-18. Outstanding wine selection as well. Lucky Noodle, located across from 5th St. Market. Asian cuisine with great atmosphere, delicious food and wine. Eugene's bar scene is centered around Broadway and Olive St (the "barmuda triangle") in downtown. Expect crowds every Thursday, Friday and Saturday night, especially during the school year when college students fill the streets. High Street Brewery & Cafe, 1243 High St, 345-4905. National and local micro brews. Belly (30 E Broadway, 541-344-6948) Eclectic bar with lots of character and fantastic food. Beer, wine and mixed drinks. A number of craft brew "taphouses" and local breweries specialize in Oregon micro-brews and small batch beers. Eugene City Brewery / Rogue 844 Olive St (541) 345-4155  Hours 12PM-10PM. Rogue Brewery Outpost for Eugene serving both good food and Locally brewed beer. The Bier Stein 1591 Willamette St  The Bier Stein is a connoisseur beer store located in Eugene, Oregon home of the largest beer selection south of Portland and north of San Francisco. 16 Tons Taphouse and Cafe Taphouse at 265 E 13th, Cafe at 2864 Willamette St  Bottle shop and cafe have over a dozen taps at one time, mostly small batch beer, local, national, or international, not available in bottle. First National Taphouse 51 w. Broadway  The First National Taphouse has a wide range of local beer on tap, priced based on the amount remaining in each tap. Ninkasi Brewing 272 Van Buren Street  Brewery with tasting room and outdoor patio. Oakshire Brewing Public House 207 Madison St  Oaskshire Brewing Public House features several small batch and single barrel brews in addition to their permanent brews. Falling Sky Brewing 1334 Oak Alley  Brewery with kitchen, connected to their home brewer supply shop. Fans of craft beer may be interested in the Eugene Ale Trail promotion, where you can pick up a passport to take to a bunch of different participating pubs around Eugene for stamping. Once the requisite number of stamps are acquired the passport can be redeemed at the Adventure Center in Springfield for a growler or stainless steel cup. The wineries of the Willamette Valley pride themselves in offering a relaxing and inviting experience for guests from downtown Eugene tasting rooms to vast countryside vineyards. Iris Vineyard Specializes in producing small quantities of quality, hand-crafted Pinot Noir, Pinot Gris, and Chardonnay. Iris Hill has been dedicated to growing high quality fruit through sustainable viticultural practices. King Estate The 1,033 acre certified organic Estate includes 250 acres of certified vineyards, grapevine grafting and propogation, nursery, orchards and garden. A visitor center and market place are open to the public. The Oregon Wine Warehouse Tour Oregon's wine country in Downtown Eugene. Offering wine from over 150 Oregon wineries, wine tasting flights, food and more. Shipping is available nationwide. The Eugene Hotel, whose large sign is a prominent feature of Eugene's skyline, is actually a retirement community. Courtesy Inn Eugene, 345 West 6th Ave, +1 888 259-8481, Fax: +1 541 342-6507, . Best Western New Oregon Motel 1655 Franklin Blvd (541) 683-3669‎  Located near U of O campus. Hotel has heated indoor swimming pool, hot tub, saunas, basketball and racquetball court. Valley River Inn, 1000 Valley River Way, Reservations: +1 800 543-8266, Phone" +1 541 743-1000, . A resort-style hotel and conference center, located along the quiet banks of the Willamette River. Open since 1973. Hilton 66 East 6th Ave (541) 342-2000  Standard Hilton quality located adjacent to Hult center and convention center in downtown. Comfort Suites Eugene, 3060 East 25th Ave, Tel: +1 541 343-7000. . Comfort Suites offers superb lodging in Eugene, OR, including daily complimentary breakfast, indoor pool and free high-speed wireless. Two miles from The University of Oregon. It is highly unlikely that you will become the victim of a violent crime while in Eugene. However, the city currently faces many issues with respect to drug use, property crime, and most notably to tourists, bicycle theft. If you are to turn your back on bicycles, backpacks, or other personal belongings, you can safely assume them to be gone in less than a minute. While violent crime rates remain low, visitors should expect to interact with homeless people and street youth while in the downtown and campus neighborhoods, as the city has one of the highest homeless rates in the U.S. Neighborhoods where poverty and property crimes are especially high are the Whiteaker, Downtown, Four Corners (where Hwy 99 and Roosevelt intersect), and certain parts of Springfield. Visitors may also be subjected to uncomfortable surroundings near the Washington-Jefferson Skate Park underneath Hwy 105 in the Whiteaker, where open drug use is common and vagrants congregate. Cascade Mountains 1-2 Hours by car. Oregon Coast 1 hour. Cities include Florence,OR and Yachats, OR. Eat at Mo's in Florence, take a hike en route at Kentucky Falls and hit the Hobbit trail just north of Florence. Some of the largest coastal Sand Dunes are south of Florence with various tour companies and quad rentals available on the highway south of Florence. McKenzie River 15 min - 3 hours. Take Hwy 126 east which runs along River corridor into mountains. Various waterfalls and fishing spots abound. Rafting Guided or self guided rafting trips are available through Oregon River Sports  (541)334-0696, along the Mckenzie River or Alton Baker Park. Eight person raft is currently $95 dollars a day including all needed equipment. Hourly rental in the park is currently $10 and is a great way to spend an afternoon. McCredie Hot Springs on the right just past mile-marker 45 on highway 58. Blair Lake and Meditation Pool (Wall Creek), take highway 58 to Oakridge, left on Union St, right on 1st, ten miles or so to a left turn on Forest Service Road 1934. Meditation Pool is on your left after about 3/4 mile (trailhead, about 1/3 mile walk to the pool), Blair lake is all the way at the top. Be sure to detour near the top when you see a road going off to the left marked by a trail marker (picture of two people hiking) for a spectacular view. Blair lake has campsites and hiking, Meditation Pool is a warm spring. This page was last edited on 14 April 2019, at 04:04.